Relay for Life: Great Cause, Uncanny Parallels to Hooverville? In all seriousness, though, over 1,000 Berkeley students took to the Edwards Stadium track from 10:00 a.m. yesterday until 10:00 a.m. today to raise almost $37,000 for the American Cancer Society’s Relay for Life. 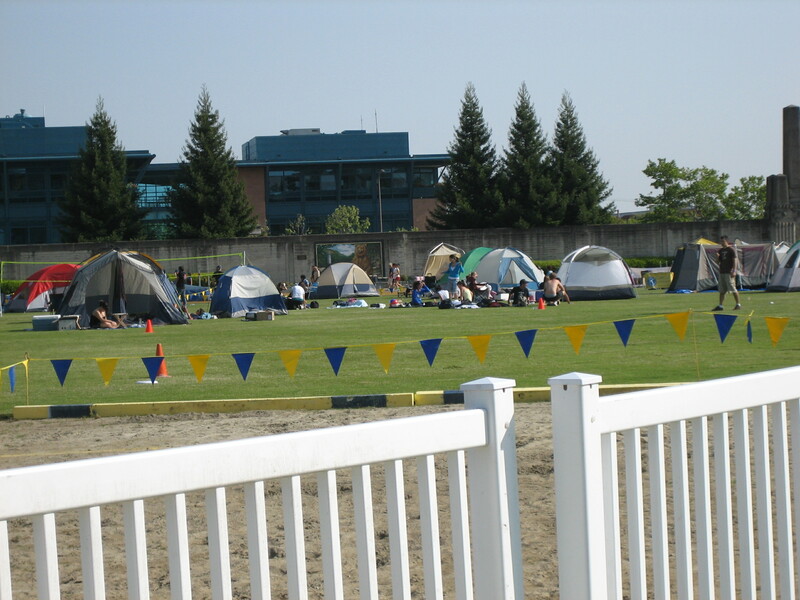 Participants formed teams and camped out on the field, while at least one member of the team circled the track at all times throughout the 24-hour period. The event had the whole fund-raising bit down pat–free food, free clothing, myriad entertainment. It was almost as if they set up some kind of small Depression Era shanty town of temporary dwellings right there in the stadium … almost? OK, maybe not. Also, we’re jerks. Anyway, various student organizations came out to “celebrate, remember, and fight back.” The Greeks were out in spades, as were cultural clubs and performance groups. The top team was sorority Alpha Omicron Pi. Nicely done, Berkeley!